How to tell if your MacBook battery needs to be replaced. The battery life of an Apple MacBook is something that PC laptop users dream about. 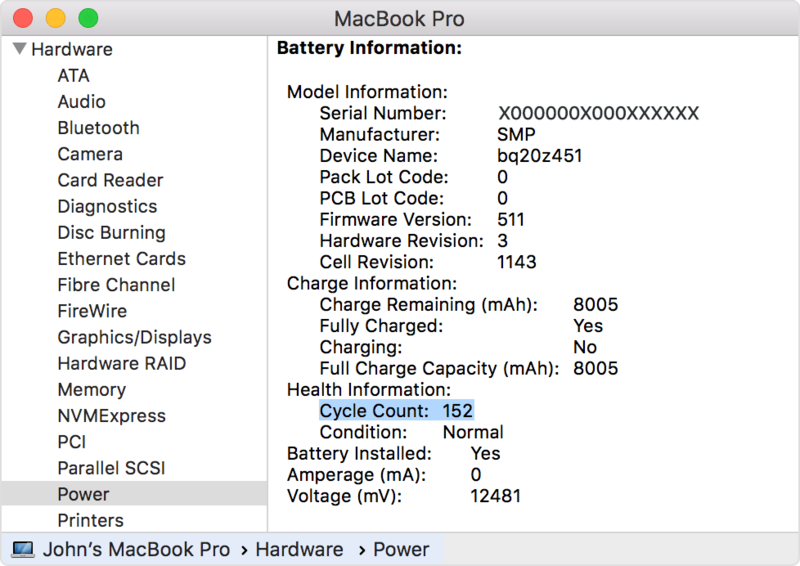 It's normal for MacBook Air users to get 12 hours on a single charge, and MacBook Pro users should get several hours, even if the laptop is a few years old. But, the battery life will get worse over time. There is nothing that anybody can do to prevent that. The issue comes when it is time to replace the battery. They are not designed to be replaceable by members of the public, which makes some people think that they are not replaceable at all. That's not true. The battery in a MacBook, whether it's a MacBook Pro or Air, can be replaced with a new model and many more years use can be had. Looking for iPhone battery replacements? The fastest way to check if your MacBook is in need of a new battery is to open System Profiler. This is located in Applications > Utilities and can also be accessed by going to the Apple menu > About This Mac > More Info. Click on the Power section in the list and you’ll find information like the cycle count and condition rating. The condition rating can be "Normal", "Replace Soon", "Replace Now", or "Service Battery". If your battery is listed as anything except, Condition: Normal, then you should replace your battery. macOS Sierra 10.12 or later: Open System Information by choosing “About this Mac” from the Apple Menu. Click System Report. Use of your MacBook battery is counted in the form of charge cycles. A charge cycle means using all of the battery's power, but that doesn't necessarily mean a single charge. For instance, you could use your MacBook for an hour or more one day, using half its charge, and then recharge it fully. If you did the same thing the next day, it would count as one charge cycle, not two, so it may take several days to complete a cycle. If you are not sure which type of MacBook you have, we have some information pages which can help. Or you can send us the serial number of your Mac using our contact form and we can let you know what type of Mac you have, and what your optons are for a battery replacement. You can find the serial number and other identifiers for your MacBook in macOS, on the computer’s surface, and on its packaging. Choose Apple () menu > About This Mac. The window that appears lists your computer’s model name — for example, MacBook Pro (13-inch, 2016, Four Thunderbolt 3 ports) — and serial number. Your serial number can really help SimplyFixIt to offer you personalised advice on repairs or upgrades for your model. You can also use your computer’s model identifier to get more information. In the About This Mac window, click System Report. In the System Information window that opens, find Model Identifier in the Hardware Overview section. Then use the identifier to locate your MacBook below.